It’s almost impossible to imagine Christmas without the natural embellishments of holly, ivy and mistletoe. This latest mini-anthology from Candlestick belongs to our new ‘Christmas Collection’ series and contains brand new poems by ten leading contemporary poets. A fall of snow, a returning robin, gathering sticks for a fire – each magical poem takes us deep into the heart of the Christmas spirit to celebrate its essential and simple joys. So says Jacob Polley in ‘The Red Man’, beautifully encapsulating how our experience of Christmas deepens as we move through the phases of our lives. 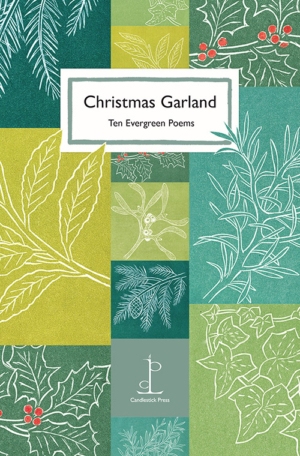 This garland of poems is something readers will want to return to again and again, to delight in its evergreen beauty. Other new Christmas anthologies from Candlestick this year are Christmas Crackers, Christmas Stocking and Fourteen Festive Sonnets. We are also publishing two seasonal short stories: Gift of the Old One, and Holly and Ivy. Poems by John Agard, Moniza Alvi, Tara Bergin, Sasha Dugdale, Alistair Elliot, John Glenday, Paula Meehan, Helen Mort, Jacob Polley and Mahendra Solanki. Cover illustration by Elaine Marshall.